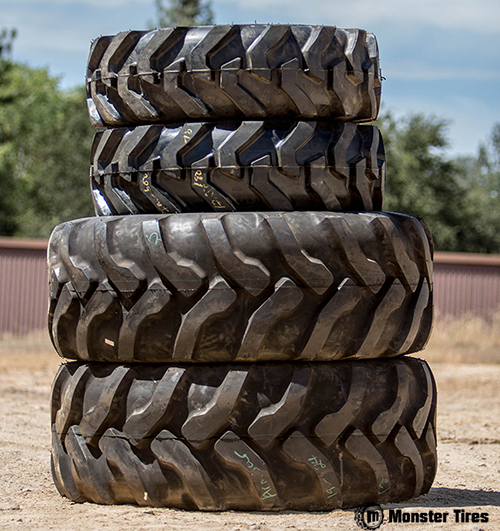 If you are looking for industrial tires in Northern California; Sacramento, Roseville, or Auburn, you have come to the right place at Monster Tires! We are proud to be your number one source for industrial tires in Northern California. Whether you need backhoe tires, skip loader tires, skid steer tires, wheel loader tires, or any other kind of heavy equipment or construction equipment tire, we have what you are looking for here at Monster Tires. The tires you put on your equipment are the literal foundation of your machine. If you don’t have a strong, stable base, there’s no way your heavy equipment can work for you. Your backhoe, skip loader, skid steer, or wheel loader has to have strong tires with good tread. If you don’t have good tires, you put your entire crew in danger of an accident, and you put your business in danger of hefty fines for not providing a safe workplace. Here at Monster Tires, our job is to get you the high quality, affordable tires you need, when you need them. We understand that every day your equipment is not being used, you lose money you could have been making. So when you order backhoe tires, skid steer tires, skip loader tires, or wheel loader tires in Sacramento, Roseville, or Auburn, we provide a 5-7 business day turnaround. You will be able to get your equipment back up and running ASAP, so you can go back to work and start making money again! If you need to order four tire sets of backhoe tires, skip loader tires, skid steer tires, or wheel loader tires, we are happy to accommodate. However, if your equipment only needs the front or back set of tires replaced, there’s no point in replacing the other set of perfectly good tires. If you need front or back wheel loader tires, skid steer tires, skip loader tires, or backhoe tires for your Auburn, Roseville, or Sacramento business, we can provide these for you as well. It is easy to replace just the front or back tires for your equipment. However, we do not sell single tires. You can’t replace only the left or right tire, because putting uneven tires on the same axle can cause serious damage to your equipment. At Monster Tire, we’re looking out for your safety and the well being of your business. If you aren’t quite sure exactly what kind of tire you need, don’t worry. We’re here to help. You can find a lot of information on our webpage, as well as an interactive information request form that will help you narrow down the options to the kind of tire you need. Or you can just give Monster Tires a call and talk to one of our helpful industrial tire experts. We will help you figure out exactly what kind of tire you need, so that you can get your backhoe, skip loader, skid steer, or wheel loader up and running again. After all, who has time to sit around and spend a week trying to figure out what kind of tire is which? You need to be back out on the job site! 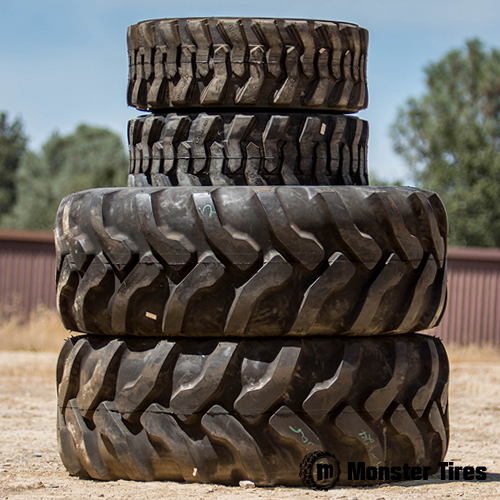 Here at Monster Tires, we offer a wide variety of tread tires to meet the requirements of whatever kind of equipment you have and whatever kind of work site you are most often on. If you work most frequently on soft ground or mud, you will probably have most luck with ag tires, which have very deep tread that has huge spaces in between. This allows the tires to get a firm grip on the ground without letting mud get stuck in between the treads. On the other hand, job sites with concrete or gravel need shallower tread with smaller spaces in between. For sites with grass that needs to be kept nice, we even have tires with very shallow, very smooth tread so that you won’t tear up the grass when you drive on it. Don’t believe anyone who tells you that all backhoe tires, skip loader tires, skid steer tires, or wheel loader tires are made the same. There are most definitely differences, and having the right tires will benefit your project immensely.